Jack Williams earned the title of “Fearless Sifter and Winnower,” earlier this fall when his column was printed in the Milwaukee Journal Sentinel. Williams chose those words carefully, working on the column for weeks to get it just right. Speaking up, though, comes as second nature to Williams who is often called on in public to speak on his research area – climate change. In an interview in his office in Science Hall after the column ran, Williams, reiterated those ideas and shared his fondness for living in Wisconsin. Williams, a California native who grew up in San Francisco, explains that his parents grew up in Ohio and Michigan and the family made many trips back to the Midwest during his childhood. His family also has strong rural ties going back to his grandmother who grew up on a farm during the Depression. When it was time to look at colleges, Williams returned to his roots. And while attending Oberlin College in Ohio, he made his first visit to Madison on a road trip with friends. Fast forward to graduate school at Brown University where he earned his Ph.D. in 1999. The UW-Madison connections got even stronger at that time when Williams’ learned that his adviser had earned his Ph.D. at the UW. After post-doctoral stints at the University of California-Santa Barbara and at the University of Minnesota-Twin Cities campus, Williams accepted his first faculty position at UW-Madison in 2004. “It’s been a great place to be a scientist and to be a professor,” Williams says 12 years later. Research in his lab spans the gamut, from field coring of lake sediments, to analyses of these sediments in the lab (mainly fossil pollen, charcoal, and related signals of past ecological and climatic changes) to continental- to global-scale syntheses of ecological data and climate models. Much of the research, including that on kettle lakes in Wisconsin, relies on the geological record and the last Ice Age as a model system to see how species have responded to past climate change. “We can see from the geological records that climates have always changed and we have a pretty good understanding about why they have changed,” Williams notes. “What I am interested in are questions such as: when the world warms very quickly over the period of a few decades, how quickly can species respond? Do species go extinct? How fast can species migrate? How do species move as groups – or reshuffle? When he talks to people about climate change, he stresses that reshuffling does occur – that species come and go and move at their own rates – and will continue to do so in coming decades. “I also emphasize that we live in a state that has been profoundly shaped by the legacies of past climate changes. Everywhere you look, you see the signatures of now vanished ice sheets. It’s amazing to realize that all this change was caused by a global warming of about 4 to 5 Celsius, which is similar to some of the higher-end scenarios expected this century,” Williams notes. On a shelf in his office is copy of the November 2016 issue of Discover magazine. The cover article, “Mystery on Mammoth Island: Final Days of Ice Age Giants” (http://discovermagazine.com/2016/nov/mammoth-island), looks at the work Williams and others conducted on an island in Alaska that had an isolated wooly mammoth population. Mainland mammoth populations went extinct about 10,000 to 15,000 years ago, but the island population survived until about 5,000 years ago. Williams hypothesizes that the mammoths on the island eventually disappeared due to a lack of freshwater. A new and growing area of study for him is geoinformatics and data management. One of the initiatives that Williams has been leading with other is the Neotoma Paleoecology Database and Community (http://www.neotomadb.org/), an online hub for data, research, education, and discussions about paleoenvironments. Anyone can go into the database and find fossil records and fossil data over the last 20,000 years or longer. It’s a great research and teaching tool. In his role as a teacher at UW-Madison, Williams says he strives to teach students how the earth works by connecting its various systems, even if it sometimes happens one core sample at a time. Among the courses he teaches is Introduction to Physical Geography. The class, which is team taught, attracts about 200 undergraduates and is an introduction to the earth system. 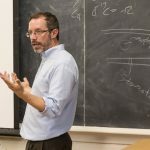 He also teaches Paleoclimatology, providing an understanding of major patterns of past climate change and the major drivers of those changes, and Climate Change: Science and Impacts, which attracts a variety of majors from economic students to journalism students who want to better understand a hot topic. More recently, he is team teaching a graduate seminar called Anticipating Abrupt Ecological Changes in the 21st Century, funded through the new UW2020 initiative with Monica Turner as the primary investigator. Williams also tells his students to think long term. “I tell them to think about having a 30-year career and to ask what will be the important issues over the next 30 years,” he advises. “I made a decision in the late 90s that since we had moved the science of climate change forward to the point that we knew that it was happening and why, that the key issue down the road was going to be adapting to climate change and how do maximize our ability to respond to climate change. 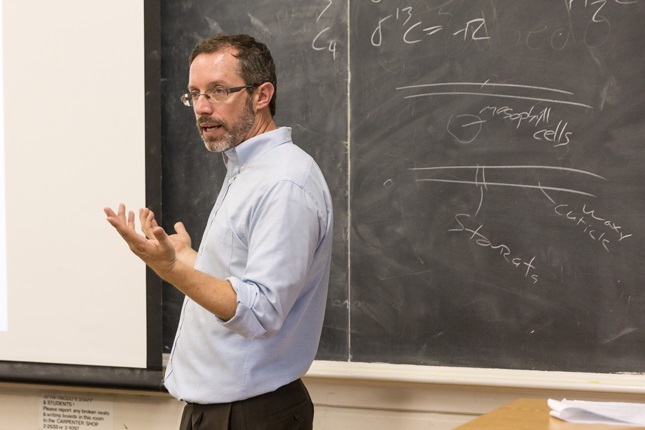 He also encourages his students to be cross trained – to be strong physical scientists with a good understanding of their study systems and able to ask new research questions, but also to excel in the new emerging fields of data science and big data. And where better to develop all of those skills than UW-Madison? For Williams there is no better place.